In an effort to become a more efficient and sustainable business, an Australian specialty chemical company decided to audit their process tanks’ CIP process in search for cost savings through time and water usage reductions. 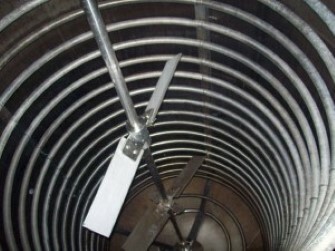 The CIP process they utilized was a fill and drain method. As a 24 hour facility, running 7 days a week they were able to make nearly 197 batches per year. Each batch took approximately 44 hours, from start to finish. Of that time, 3.65 hours were dedicated to cleaning. The total process utilized 5800 gallons of water with a caustic concentrate, per batch, totaling nearly 1.5 million gallons per year. The filling process with hot water and caustic was taking too long for the company to keep up with growing demand. The water usage was also a major concern because of drought conditions, as well as the expense of disposal. 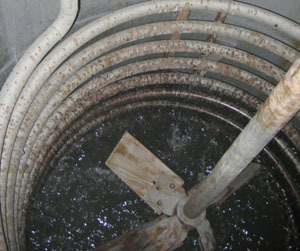 Additionally, an oily residue remained within the internal coils of the reactors after the boil out, requiring additional cleaning. The primary concerns being time and sustainability, the company introduced a mobile CIP system and an Alfa Laval Gamajet rotary impingement tank cleaning device to the process. The CIP was needed to increase the pressure as well as better utilize the heating element. This heat, a necessary component for such residues, coupled with the same concentrate of caustic and significant impact with the Alfa Laval Gamajet tank cleaner, exceeded all expectations. The device they purchased runs on 45 GPM at 100 PSI. The nozzle and stator assembly of the device was selected to optimize the cleaning solution and obtained 15 pounds of force at a 15’ distance. Coupled with hot water and the caustic, the 12 minute cycle time proved to be highly effective. All areas around the coils and behind were thoroughly cleaned, with 205 gallons of re-circulated fluid. Overall, the Alfa Laval Gamajet device reduced time and water saving by 95%. The company was then able to increase production by 12.3%, an additional 16 batches. With the pumps running at much less time, energy usage decreased by 277,800 kWh per year, reducing greenhouse gasses by 45,400 kg per year.